Making sugar cookies at Christmas with my grandmother was a family tradition when I was growing up. Making the cookies was a long process, but it was fun to transform cookie dough into mini snowmen, trees, and Santas with frosting and candy pieces. Sharing this tradition with my grandmother made it all the more special and memorable. In Jasmine Toguchi, Mochi Queen, Jasmine's family's tradition is eating mochi, a Japanese dessert made from sticky rice, to celebrate New Year's. Jasmine's family is preparing for their New Year's celebration by making mochi together. Jasmine is not old enough to help, but her older sister, Sophie, is. Jasmine is tired of Sophie always getting to do things she can't and she would much rather help make mochi than get stuck babysitting. 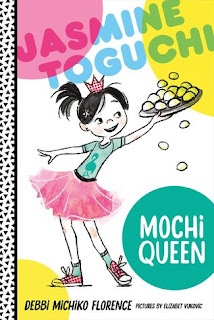 Jasmine comes up with a plan that she hopes will convince her family to let her help with the mochi, but also participate in the part of the process that is traditionally reserved for the males in the family. Jasmine is very determined and shows readers that you can achieve something if you put your mind to it. I enjoyed reading about Jasmine, but also her family who are very close and supportive of one another. Even Jasmine's bossy sister and annoying cousin help her to realize that she is stronger than she thinks. There are short chapters and many illustrations throughout the book which make this a good one to recommend to readers transitioning to chapter books. The story is fun to read, but also provides insight, for those who are unfamiliar, into a Japanese-American tradition. This is the first book in a series so those who enjoy Jasmine can read more about her. 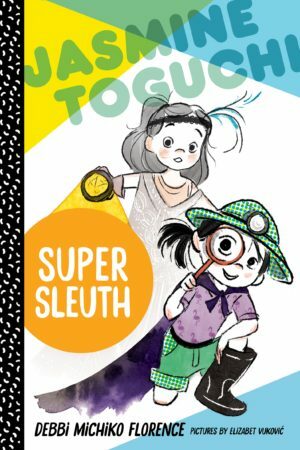 The second, Jasmine Toguchi, Super Sleuth, is also available and there are more to come. I thank the author, Debbi Michiko Florence, for providing me with the first two books in the Jasmine Toguchi series.